During the Symposium, an interactive session with youth will be organized in collaboration with Young Professionals for Agricultural Development (YPARD). It allow youth to identify and convey key messages on the role of innovation in agriculture in shaping their future and meeting their aspirations. 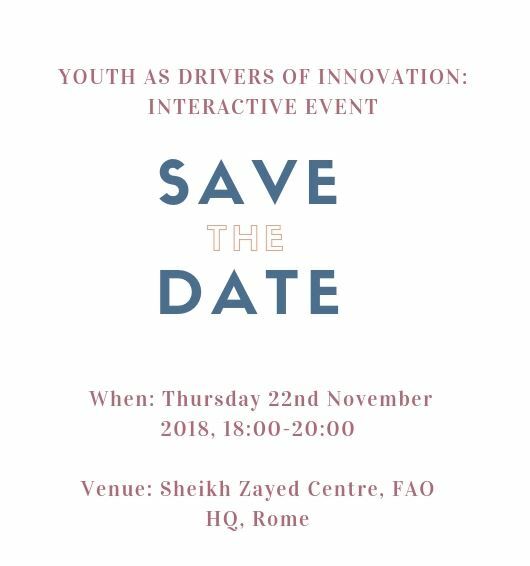 Youth representatives and innovators are invited from all around the world to join – both online and in-person –, interact with eminent experts, present the key drivers behind their innovations and share their ideas. During the event it will be also possible to send inputs or questions through social media channels. The event will provide a platform for young people to highlight their successes, concerns and drivers of innovation and contribute with their inputs to the outcomes of the Symposium. The key messages from this session, in fact, will be reported during the final Plenary of the symposium to ensure that the voices of youth are taken into consideration. The event will be moderated and webcast. Interpretation will be available in English, French and Spanish.